According to the API, Connecticut drivers pay 43.8 cents per gallon in state taxes. That figure includes Connecticut’s 25 cent gasoline excise tax and 18.8 cents per gallon in other taxes, which includes the state’s petroleum gross receipts tax. 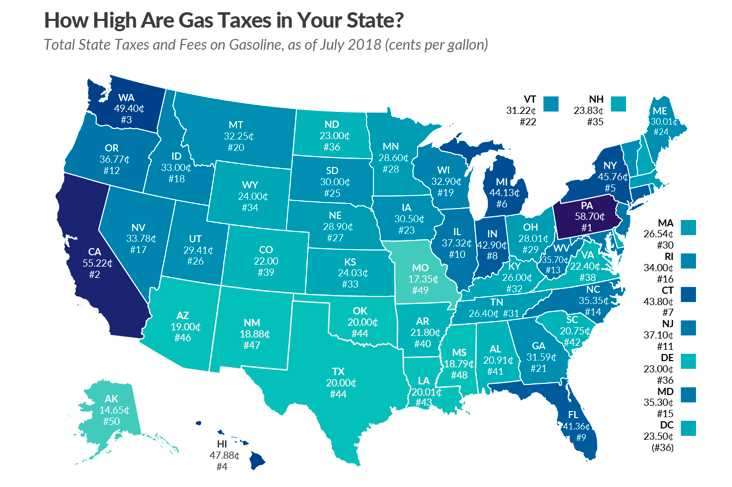 Combined with federal gas taxes, Connecticut drivers pay a total of 62.2 cents per gallon in taxes, 10 cents higher than the national average and 12.5 cents higher than the Northeast regional average. For truck drivers, the tax burden for diesel fuel increases to 68.3 cents per gallon for both state and federal taxes. Connecticut’s excise tax for diesel is 18.9 cents higher than regular gasoline, but the state’s gross receipts tax is not assessed on diesel, according to the API. Revenue from Connecticut’s gasoline taxes has fueled debate in the legislature over the need to establish tolling on Connecticut’s highways to help fund infrastructure costs. Gov. Dannel Malloy announced in January of 2018 that the Connecticut’s Special Transportation Fund was nearing insolvency. In response, the governor suspended more than $4 billion in projects, but also called for raising the gasoline tax, instituting a tire tax and establishing electronic tolls on Connecticut’s highways. The STF’s fiscal instability was blamed on increasing debt services costs and lower-than-expected revenue from the gasoline tax. Malloy pointed out that Connecticut decreased its gasoline tax in 1997 and instituted a cap on the petroleum gross receipts tax in 2012. However, a review of transportation spending from 2000 to 2018 showed revenue to the STF increased 20 percent, while debt service costs only increased 9 percent. The largest increases in spending came from public transportation and fringe benefit costs for employees. Although gasoline tax revenue has increased, it has not kept up with Connecticut’s spending. Malloy said the gasoline tax is a dying source of revenue due to increased car fuel efficiency. While Connecticut driver’s might be paying the 7th highest gasoline tax in the country, a study by the Reason Foundation called into question whether or not those funds are being used efficiently. In their annual state-by-state study of transportation spending, Reason found Connecticut had one of the transportation costs per mile of road in the country — $497,659 per mile. It also found Connecticut had the highest administrative costs in the country at $99,417 per mile. The Connecticut Department of Transportation disputed those findings. The Tax Foundation, however, did note that state gasoline taxes are not tied to inflation, which may be part of the reason gasoline tax revenue is failing to keep up with the costs of on-going infrastructure projects. Pennsylvania, California and Washington had the highest gasoline taxes in the country, while Alaska, Missouri and Mississippi had the lowest. Do you have any figure or approximation for total annual CT gasoline tax revenue?